What was once considered to be a state-of-the-art facility for Southern Illinois Miners Baseball is quickly branching out into an all-encompassing venue space for the masses. The Summer of 2019 at Rent One Park will look quite different from those of years past. This includes Southern Illinois’ very own Professional Softball Team, the Canadian Wild of Southern Illinois. Often referred to as the ‘MLB’ of softball, these athletes, largely composed of women from the Canadian Olympic Team, will soon call Marion and the rest of the region home. As some of the best players in the world, the Canadian Wild will be preparing to qualify for the 2020 Olympics in Tokyo, Japan. 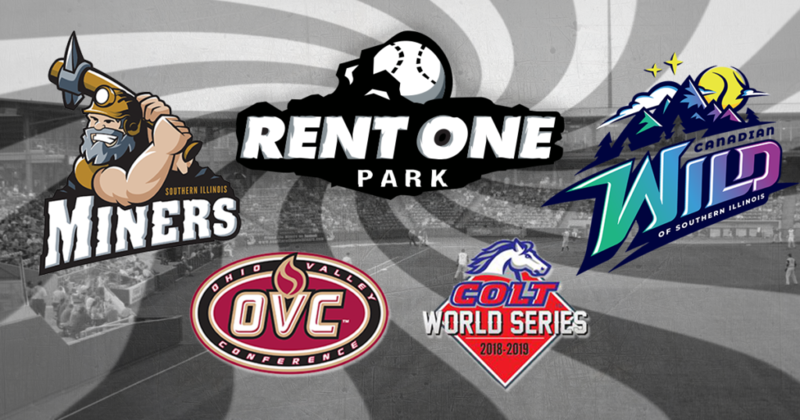 The excitement does not stop there, however, as Rent One Park will also be hosting the 2019 Ohio Valley Conference (OVC) Baseball Championships starting May 21st and concluding on May 26th. Rent One Park will act as a neutral site for colleges around the region to compete at an extremely high level. In addition, the PONY Baseball Colt World Series will return to Marion for its 2nd year. The tournament consists of teams from around the world and offers a unique experience to all participants. The Herrin Chamber of Commerce serves and supports the civic, cultural, and economic good of the greater Herrin area with priority given to economic development and the assistance necessary to acquire and retain business and industry in Herrin and the surrounding region.